Maureen Hackett speaks after receiving an honorary Doctor of Humane Letters degree from Indiana University at the 2018 Commencement. Today, the world is taking an important step in removing cultural biases that affect how we think about, talk about, and address emotional well-being and mental health. October 10 was World Mental Health Day, and on October 11-12, the Global Summit on Mental Health Culture Change will discuss these important issues in London. 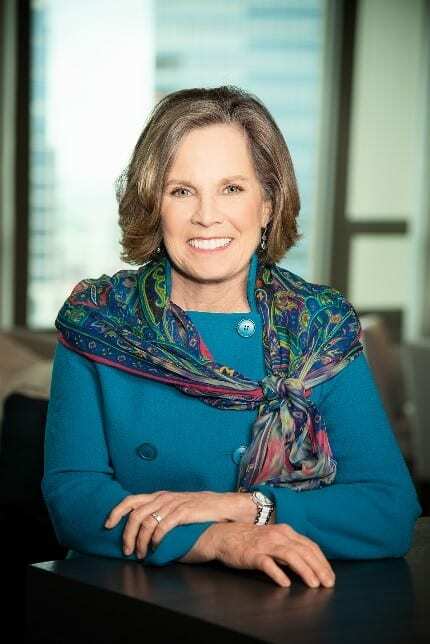 Lilly Family School of Philanthropy lifetime board member and former chair Maureen Hackett will be joining other Meadows Mental Health Policy Institute (MMHPI) board members from Texas for this summit dedicated to collaborative discussions on mental health in the UK and USA. Ann Boyd-Stewart, assistant dean of development and alumni relations, had the opportunity to discuss the motivations for Hackett’s philanthropy. You can also read about Hackett’s transformational gift to create the Hackett Mental Health Center. Q: The Lilly Family School of Philanthropy will be mounting photos of all of our named chairs and donors. You and Jim were the gracious donors of the nation’s first endowed chair in women’s philanthropy, the Eileen Lamb O’Gara Chair in Women’s Philanthropy, which you established at the Lilly Family School of Philanthropy in 2012. Help us to capture the story of the gift and who Eileen Lamb O’Gara is. Funny you should ask. One of nine children, I have five siblings who have graduated from Purdue University, all of whom question why I would ever do something like this for Indiana University. The motivation behind the gift was my mother, Eileen Lamb O’Gara, for whom the chair is named. 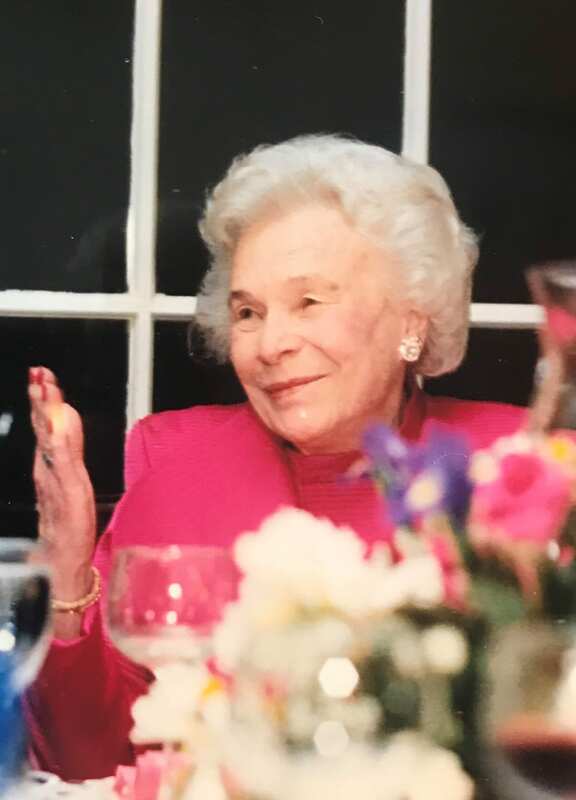 All my life, I saw my mother as an outstanding philanthropist, and I wanted to recognize and honor her in a way (and at a place) that would preserve her legacy for years to come. Way ahead of her time, my mother put herself through college, graduating with a business degree from Purdue University in 1936. She married and subsequently started a family that would ultimately include nine children. As the sixth child, I never knew my father to work during my lifetime. He suffered with depression and alcoholism, so my mom returned to work in her 50s. While raising the children, she had to work to cover all family expenses. Times were tough, but she was extremely savvy. She mortgaged the house I grew up in four times and made ends meet no matter the effort. Amidst everything, she founded an employment agency and executive education school for women. Through her school, she hoped to leverage her skills and life experience to help other women of no-to-moderate means find a place in “corporate America” so they could provide for their families. She knew what it took, and she wanted to empower other women to succeed. She couldn’t afford to give away any money, but my mom’s philanthropic spirit was manifest in the wisdom, compassion, faith and trust she shared with so many during her life. Fortunately, that same spirit is within me. As a young girl, I volunteered at a Northwestern University Hospital, where I one day walked into what was termed a “crisis center,” just to see what they did. I didn’t realize then, but my initial curiosity about a mysterious wing of the hospital would eventually be the foundation for my passion in mental health. At that crisis center, I learned about depression, alcoholism, and the way both can affect an entire family and community. I developed a much greater understanding and appreciation for what my dad was going through and the strength it took my mom to overcome the daily struggles of his disease without ever belittling him for it. Endowing her chair at the Women’s Philanthropy Institute was an absolute honor. 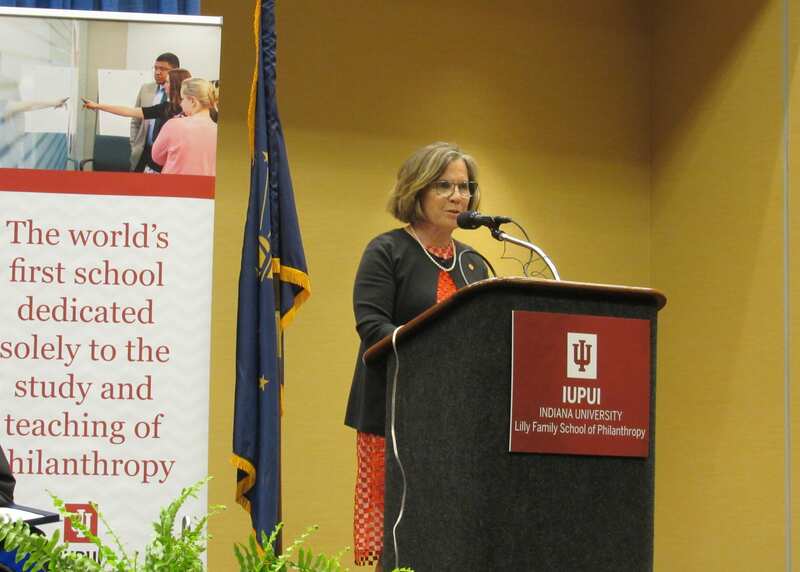 I have known no better model of philanthropy, and I am so pleased to have been blessed such that I can share her legacy with others through the Lilly Family School of Philanthropy. Q: Did your father get to see what you were doing for mental health? Q: Have you transferred your philanthropic values to your own children? Yes, we have. Jim and I have been married for over 40 years. We’ve moved our family a lot, and we’ve worked extremely hard. It’s because of our financial blessings that we’ve been able to give back, and we’ve always believed we must do just that. Having been raised with the example of my mother and father, and their deep faith and community giving, there has never been a question that it is our duty to be equally giving of our blessings. From a young age, no matter where we lived, I always involved my children in my volunteerism to instill in them the same sense of responsibility. It was equally important to me that they learn how fulfilling it can be to give back to others. Now in their 30s, each of them volunteers in a number of areas (e.g., mental health, education, religion, law, screenwriting, and more), and the next generation is starting to learn the ropes too. My three grandchildren are very aware of their blessings and have such generous and kind hearts. I can see my mother in all of them. Q: Will you pass this giving tradition down through the Hackett Foundation? The honest answer is, “I don’t know.” We are at a place in our lives where we are trying to determine the long-term plan for the family foundation. My children and grandchildren are more than capable of managing the foundation, and I have no doubt they would do a great job. However, I don’t want the legacy of the family to be something bound by the legal constraints of a foundation, something that only manifests itself in the monetary grants made around a board room table a couple of times each year. More important to me is that the giving tradition and legacy of our family be captured in everyone’s spirit, every day. Whether it’s through monetary gifts, expertise, or one’s time, I want my family to focus on generosity of the soul. Give whatever you have to whomever needs it most. Share your blessings. Q: Is there a stigma within your friends about mental health? I wouldn’t say there’s a stigma. Prior to my work in the area, my friends were simply uninformed. I see it as my role to provide them with enough information to make a reasoned and fact-based opinion about research, treatment, policy, etc. Now, I have more coming to me for help and wondering how they can get involved. I don’t like the word “stigma.” It holds more power than it should, and it’s self-defeating. I like to flip it to the positive. Let’s stop talking about what might be holding us back and instead focus on what can push us forward. I’m working in policy to make significant changes with respect to access to care and children’s prevention, and I’m hoping to inspire others to do the same. Q: What would success look like in this work? Truthfully, I think the greatest success would be to have a collaborative conversation on a global level, resulting in a platform or model that could work across states, seas, and borders that provides humankind with knowledge of the brain and the need to keep it healthy. If we can create a model in Texas providing information, care, funding, and proof of successful impact that can then be translated to the next state, and the next state, and eventually, the entire country, that’s what I’d like to see. Success would be talking about it with the facts and understanding the role of each and every individual to make this better. It takes leadership, informed courage, and energy to carry the fight forward. Quite honestly, it takes an army. We created the Hackett Center because I’ve worked in this niche as an advocate and volunteer for 35 years and I know what it’s like to feel like you just can’t get to the finish line or you can’t even get close. So, I thought, this is it, we need hard data, research, and facts to put together a model that truly makes a difference. That kind of success is something for which I am more than ready to fight. What an inspiring Q&A. Maureen Hackett is clearly a wonderful person and an articulate spokeswoman for the values that the Lilly Family School of Philanthropy embodies and its alumni cherish. I have printed today’s blog post so that I can reread it anytime my spirit needs a reboot. Yes, Dr. Hackett is a model the world needs to follow.